Ingredients: Scutellaria root , white chrysanthemum flower , lonicera flower , dandelion . Clearing heat, resolving toxin. This tea is helpful for many kinds of inflammation with burning sense. Let the health tea infuse with boiling water. When the tea is finished, you can put more boiling water into the cup. For adult, 1 sachet could be infused for 2-3 times. For the children between 6-12 years old, 1/2 sachet per day, for the children under 6 years old, 1/3 sachet per day. Favor: If you order one packet, we will gift you another packet. Ingredients: Lonicera flower , forsythia fruit , prepared pinellia tuber , aster root, tussilago flower . Clearing heat, reducing phlegm, stopping cough. This tea is helpful for coughing with yellow phlegm or dry throat. Ingredients: Schizonepeta , morinda root , prepared pinellia tuber , aster root, tussilago flower . Expelling cold, reducing phlegm, stopping cough. This tea is helpful for coughing with white phlegm due to external cold. Ingredients: Tangkuei , ligusticum root , cooked rehmannia root , flowery knotweed root , white peony root . Enriching blood. This tea is helpful for lack of blood with symptoms of dizziness, fatigue, pale complexion. Ingredients: Spiny jujube kernel , flowery knotweed stem, silk tree bark , biota seed , polygala root . Enriching blood, calming tea spirit. This tea is helpful for poor sleeping. Ingredients: Scutellaria root , gardenia fruit , dioscorea root , solomon’s seal root , trichosanthes root . Moistening yin fluids, clearing heat, tonifying the spleen. This tea is helpful for diabetes. Ingredients: Crataegus fruit , medicated leaven , barley sprout , codonopsis root , dioscorea root . Tonifying spleen, promoting appetite. This tea is helpful for improving appetite. If using for babies, please reduced 50% or 70% dosage. Ingredients: Bupleurum root , curcuma tuber , bitter orange , scutellaria root , licorice root . Soothing the liver, disinhibiting the gall-bladder. This tea is helpful for gall-bladder inflammation and pains. Ingredients: Pueraria root , scutellaria root , phellodendron bark , saussurea root , Tangkuei . Clearing heat, stopping diarrhea. 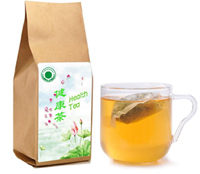 This tea is helpful for hot intestine inflammation with symptoms of burning discomfort, diarrhea with strong bad smell. Ingredients: Amomum fruit , cyperus root , tangkuei , alpinia fruit , codonopsis root . Warming intestines, stopping diarrhea. This tea is helpful for cold intestine inflammation with symptoms of diarrhea with clear and thin discharge without much strong smell.